The Tycho Brahe capsule sits atop the Hybrid Exo Atmospheric Transporter (HEAT) 1X booster in preparation for an off-shore launch. The Nautilus submarine is docked in the foreground. Editor's Note: This story was updated Friday to reflectthe latest launch time. A private Danish rocket built by volunteers to launch oneperson into suborbital space is now slated to launch no earlier than Sundaywith a dummy pilot riding aboard. If successful, the rocket ? built by the group CopenhagenSuborbitals ? should carry its payload up almost 19 miles (30 km) into theupper atmosphere. The project could pave the way for Denmark to eventuallybecome the fourth space-faring nation to send humans into space after Russia,the United States and China. 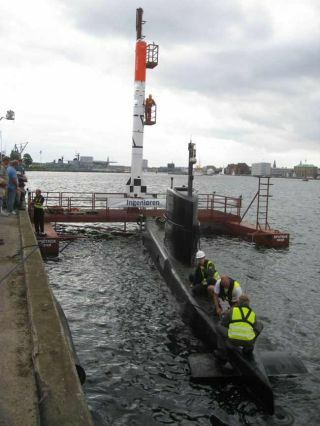 There is a 70 percent chance of the launch occurring Sundaynear the Danish island of Bornholm in the Baltic Sea on Saturday, according tothe website of Copenhagen Suborbitals. The test flight has a launch window thatruns through Sept. 17. The new suborbital rocket is called the Hybrid ExoAtmospheric Transporter 1X, or HEAT-1X. It carries a TychoBrahe space capsule, which can hold one pilot in a half-standing,half-sitting posture. But the rocket will just carry a dummy for the first severalsuborbital flights to see how much G-force a human would endure. One G isequivalent to Earth's standard gravity. "We get three Gs half-sitting,half-standing," said Peter Madsen, cofounder of Copenahgen Suborbitals. "Higher G loads may occur during re-entry, but here the capsule isoriented in a sidewards position where the astronaut has excellent Gtolerance." The $70,000 effort funded by private sponsorsand donations includes the capsule, booster and an offshore launch platform. During the Tycho Brahe capsule's descent, adrogue parachute and three main parachutes should deploy and carry it back downfor recovery in the water by a fast boat. Tracking radar and GPS should also help theground team keep an eye on the launch and return. Madsen decided to kick-start the private rocket venture whenhe met Kristian von Bengtson, an aerospace engineer who has worked with NASA onMarsand lunar programs. They gathered a small group of about 19 supporting teammembers. "We get a lot of support ? and haveaccess to experts that would be very expensive if we were commercial,"Madsen told SPACE.com. "I honestly don't think we can afford to becommercial." The Tycho Brahe capsule draws inspiration from the NASAspace capsules of the Mercury, Gemini and Apollo programs, von Bengtson wrotein an e-mail. But he also aimed to simplify the overall design. Liquid oxygen serves as the oxidizer part ofthe propellant, and polyurethane acts as the rocket fuel propellant.That allows the HEAT-1X booster to burn for 60 seconds and create almost 9,000pounds of thrust (40 kN). The inaugural flight should allow the Danish team to testthe offshore launch concept, the high-speed aerodynamic properties of thevehicle, engine performance and recovery scenarios. Wireless telemetry givesreal-time updates on the booster during burns. Read the rest of the original story here.